We began as a newspaper series in 2009 and didn’t expand online until one year ago. 2013 was an exciting year as we launched the ETLK website, jumped into social networking, and published our first book. Thank you for following us so far and stay tuned for big projects ahead! 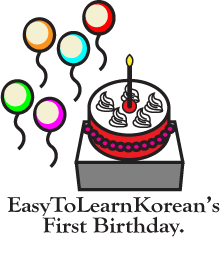 This entry was posted in Uncategorized and tagged anniversary, Birthday, first birthday by easykorean. Bookmark the permalink.